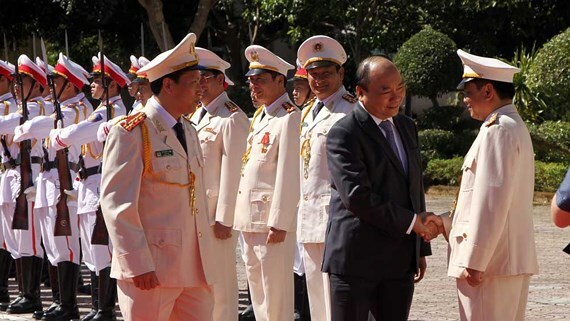 Dak Nong (VNA) – Prime Minister Nguyen Xuan Phuc on January 14 checked the combative readiness of police in the Central Highlands province of Dak Nong, asking them to stay vigilant and ensure public safety is maintained during the upcoming Tet (Lunar New Year) festival. The leader lauded the efforts made by provincial public security forces in ensuring political security, and social order and safety throughout 2018, thus creating a safe environment for people and businesses, and stable conditions for the locality’s development. While in Dak Nong, he attended the inaugural ceremony of a memorial house dedicated to President Ho Chi Minh. Built within the headquarters of the provincial police, with funding raised by local police officers and donors, the house is a copy of the stilt house in Hanoi where the President lived during the last few years of his life. PM Phuc highlighted the cultural and educational significance of the house, saying it will serve as a venue for local police to study the ideology, morality, and lifestyle of the late President.